, an eminent dissenting minister, was born at Hungerford, in Berkshire, in 1693, where his father was then pastor of a congregation of protestant dissenters. He early discovered a genius for literature, which was carefully cultivated; and being placed under proper masters, he made a very uncommon progress in classical learning, and especially in the Greek tongue. 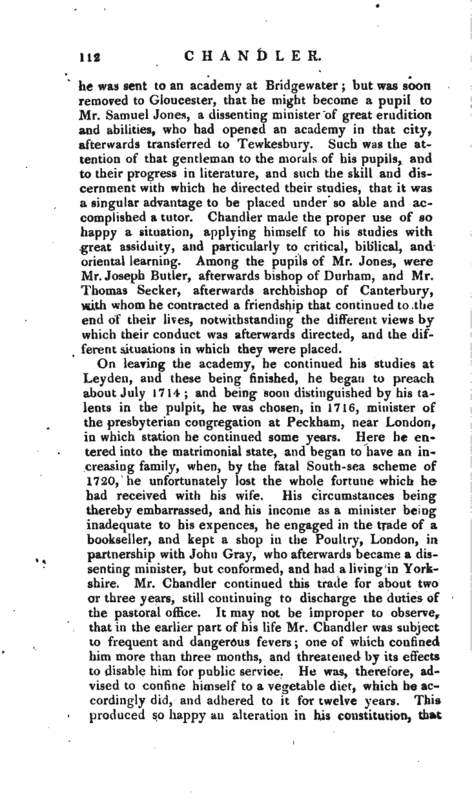 As it was intended by his friends to bring him up for the ministry, | he was sent to an academy at Bridgewater; but was sbort removed to Gloucester, that he might become a pupil to Mr. Samuel Jones, a dissenting minister of great erudition and abilities, who had opened an academy in that city, afterwards transferred to Tewkesbury. Such was the attention of that gentleman to the morals of his pupils, and to their progress in literature, and such the skill and discernment with which he directed their studies, that it was a singular advantage to be placed under so able and accomplished a tutor. Chandler made the proper use of so happy a situation, applying himself to his studies with great assiduity, and particularly to critical, biblical, and oriental learning. Among the pupils of Mr. Jones, were Mr. Joseph Butler, afterwards bishop of Durham, and Mr. Thomas Seeker, afterwards archbishop of Canterbury, with whom he contracted a friendship that continued to the end of their lives, notwithstanding the different views by which their conduct was afterwards directed, and the different situations in which they were placed. On leaving the academy, he continued his studies at Leyden, and these being finished, he began to preach about July 1714; and being soon distinguished by his talents in the pulpit, he was chosen, in 1716, minister of the presbyterian congregation at Peckham, near London, in which statioji he continued some years. Here he entered into the matrimonial state, and began to have an increasing family, when, by the fatal South-sea scheme of 1720, he unfortunately lost the whole fortune which he had received with his wife. His circumstances being thereby embarrassed, and his income as a minister being inadequate to his expences, he engaged in the trade of a bookseller, and kept a shop in the Poultry, London, in partnership with John Gray, who afterwards became a dissenting minister, but conformed, and had a living in Yorkshire. Mr. Chandler continued this trade for about two or three years, still continuing to discharge the duties of the pastoral office. It may not be improper to observe, that in the earlier part of his life Mr. Chandler was subject to frequent and dangerous fevers; one of which confined him more than three months, and threatened by its effects to disable him for public service. He was, therefore, advised to confine himself to a vegetable diet, which he accordingly did, and adhered to it for twelve years. This produced so happy an alteration in his constitution, that | though he afterwards returned to the usual way of living, he enjoyed an uncommon share of spirits and vigour till seventy. While Mr. Chandler was minister of the congregation at Peckham, some gentlemen of the several denominations of dissenters in the city, came to a resolution to set up and support a weekly evening lecture at the Old Jewry, for the winter half year. The subjects to be treated in this lecture were the evidences of natural and revealed religion, and answers to the principal objections against them. Two of the most eminent young ministers among the dissenters were appointed for the execution of this design, of which Mr. Chandler was one, and Mr. (afterwards Dr.) Lardner, who is so justly celebrated for his learned writings, was another. 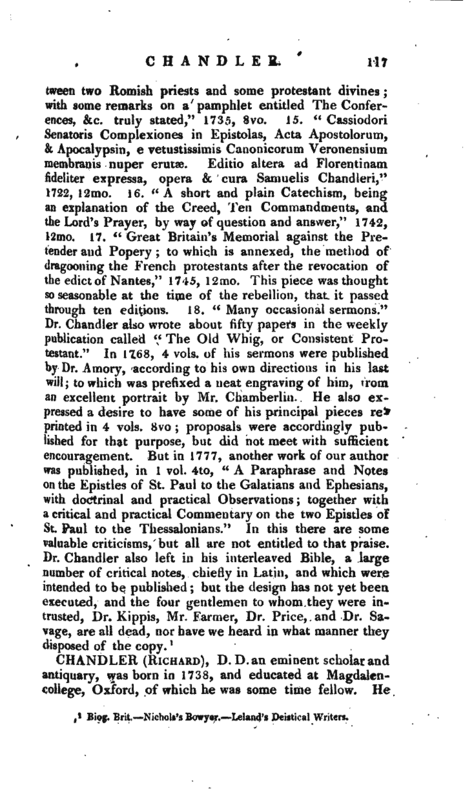 But after some time this lecture was dropped, and another of the same kind set up, to be preached by one person only, it being judged that it might then be conducted with more consistency of reason and uniformity of design; and Mr. Chandler was appointed for this service. 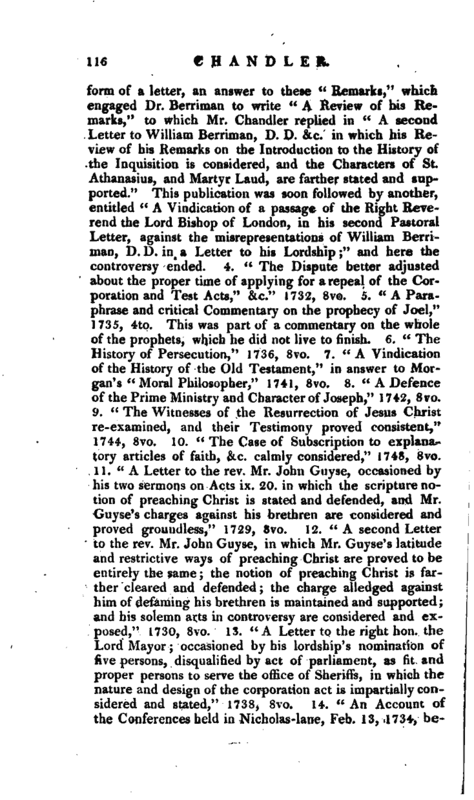 In the course of this lecture he preached some sermons on the confirmation which miracles gave to the divine mission of Christ, and the truth of his religion; and vindicated the argument against the objections of Collins, in his “Discourse of the grounds and reasons of the Christian religion.” These sermons, by the advice of a friend, he enlarged, and threw into the form of a continued treatise, and published in 1725, 8vo, under the following title: “A Vindication of the Christian Religion, in two parts, I. A discourse on the nature and use of Miracles II. 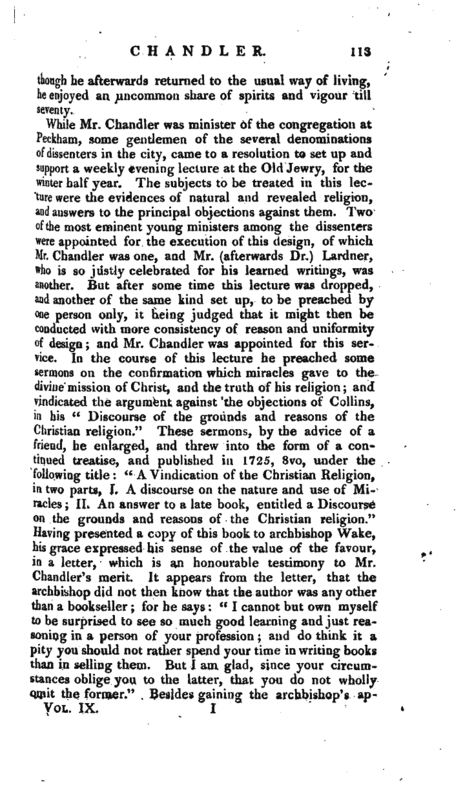 An answer to a late book,entitled a Discourse on the grounds and reasons of the Christian religion.” Having presented a copy of this book to archbishop Wake, his grace expressed his sense of the value of the favour, in a letter, which is an honourable testimony to Mr. Chandler’s merit. It appears from the letter, that the archbishop did not then know that the author was any other than a bookseller; for he says: “I cannot but own myself to be surprised to see so much good learning and just reasoning in a person of your profession; and do think it a pity you should not rather spend your time in writing books than in selling them. But I am glad, since your circumstances oblige you to the latter, that you do not wholly omit the former.” Besides gaining the archbishop’s | approbation, Mr. Chandler’s performance considerably advanced his reputation in general, and contributed to his receiving an invitation, about 1726, to settle as a minister with the congregation in the Old Jewry, which was one of the most respectable in London. 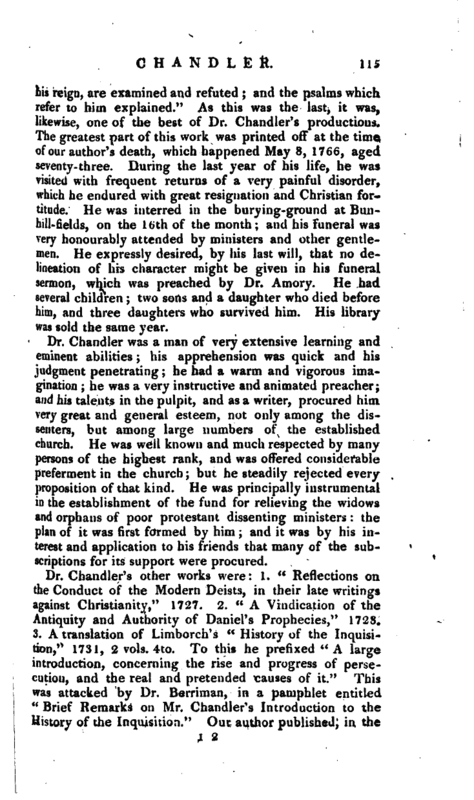 Here he continued, first as assistant, and afterwards as pastor, for the space of forty years, and discharged the duties of the ministerial office with great assiduity and ability, being much esteemed and regarded by his own congregation, and acquiring a distinguished reputation, both as a preacher and a writer. His writings having procured him a high reputation for learning and abilities, he might easily have obtained the degree of D. D. and offers of that kind were made him; but for some time he declined the acceptance of a diploma, and, as he once said in the pleasantness of con versation, “because so many blockheads had been made doctors.” However, upon making a visit to Scotland, in company with his friend the earl of Finlater and Seafield, he with great propriety accepted of this honour, which was conferred upon him without solicitation, and with every mark of respect, by the two universities of Edinburgh and Glasgow. He had likewise the honour of being afterwards elected F. R. and A. Ss. the former in 1754. On the death of George II. 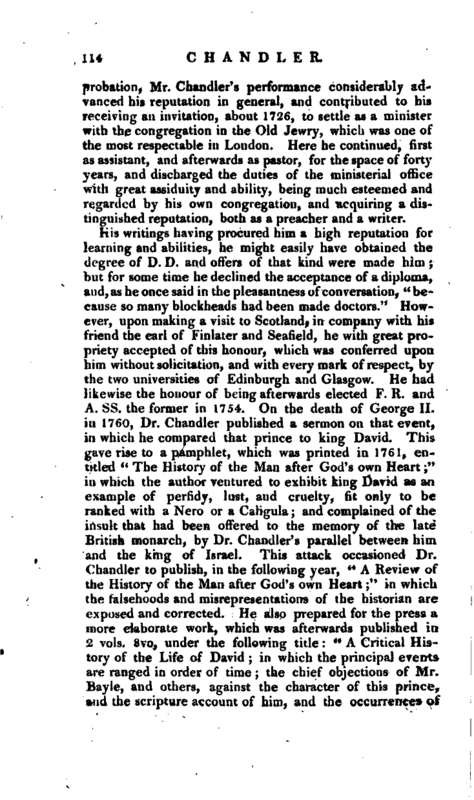 in 1760, Dr. Chandler published a sermon on that event, in which he compared that prince to king David. This gave rise to a pamphlet, which was printed in 1761, entitled “The History of the Man after God’s own Heart” in which the author ventured to exhibit king David as an example of perfidy, lust, and cruelty, fit only to be ranked with a Nero or a Caligula; and complained of the insult that had been offered to the memory of the late British monarch, by Dr. Chandler’s parallel between him and the king of Israel. This attack occasioned Dr. Chandler to publish, in the following year, “A Review of the History of the Man after God’s own Heart;” in which the falsehoods and misrepresentations of the historian are exposed and corrected. He also prepared for the press a more elaborate work, which was afterwards published in 2 vols. 8vo, under the following title: “A Critical History of the Life of David; in which the principal events are ranged in order of time; the chief objections of Mr. Bayle, and others, against the character of this prince, and the scripture account of him, and the occurrences of | his reign, are examined and refuted; and the psalms which refer to him explained.” As this was the last, it was, likewise, one of the best of Dr. Chandler’s productions. The greatest part of this work was printed off at the time of our author’s death, which happened May &> 1766, aged seventy-three. During the last year of his life, he was visited with frequent returns of a very painful disorder, which he endured with great resignation and Christian fortitude. He was interred in the burying-ground at Bunhill-fields, on the 16th of the month; and his funeral was very honourably attended by ministers and other gentlemen. He expressly desired, by his last will, that no delineation of his character might be given in his funeral sermon, which was preached by Dr. Amory. He had several children; two sons and a daughter who died before him, and three daughters who survived him. His library was sold the same year. 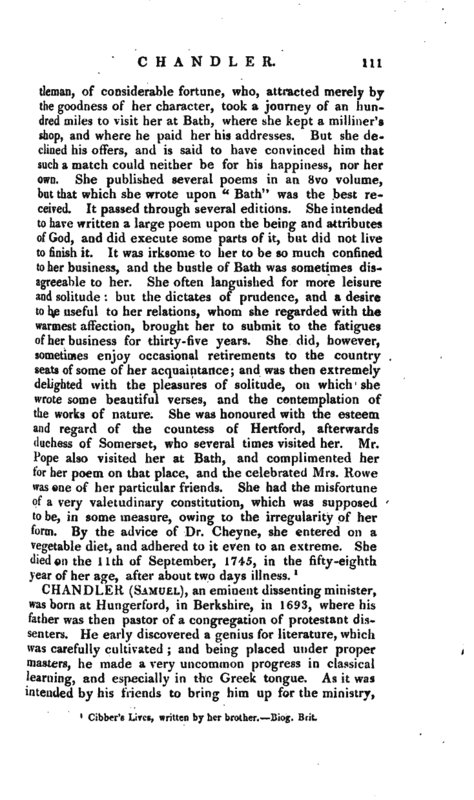 Dr. Chandler was a man of very extensive learning and eminent abilities; his apprehension was quick and his judgment penetrating; he had a warm and vigorous imagination he was a very instructive and animated preacher; and his talents in the pulpit, and as a writer, procured him very great and general esteem, not only among the dissenters, but among large numbers of the established church. He was well known and much respected by many persons of the highest rank, and was offered considerable preferment in the church but he steadily rejected every proposition of that kind. He was principally instrumental in the establishment of the fund for relieving the widows and orphans of poor protestant dissenting ministers: the plan of it was first formed by him; and it was by his interest and application to his friends that many of the subscriptions for its support were procured.